As of June 15, 2012, MMWD’s solar photovoltaic arrays on the Administration Building and in the Corporation Yard have generated a combined 1,000 MWh of clean, renewable energy. The solar arrays were installed during the summer of 2009 and began operating in August and September of that year. The Corporation Yard arrays, which supply all the buildings except the Water Quality Lab and the Operations Center, have produced slightly over 100 percent of the energy needs for that portion of the Yard. The Administration Building array has produced about 45 percent of the energy use of the district’s office building. In addition, by this coming month MMWD will have enrolled all of its 236 electric accounts in Marin Clean Energy’s “Light Green” 50 percent renewable electricity option. 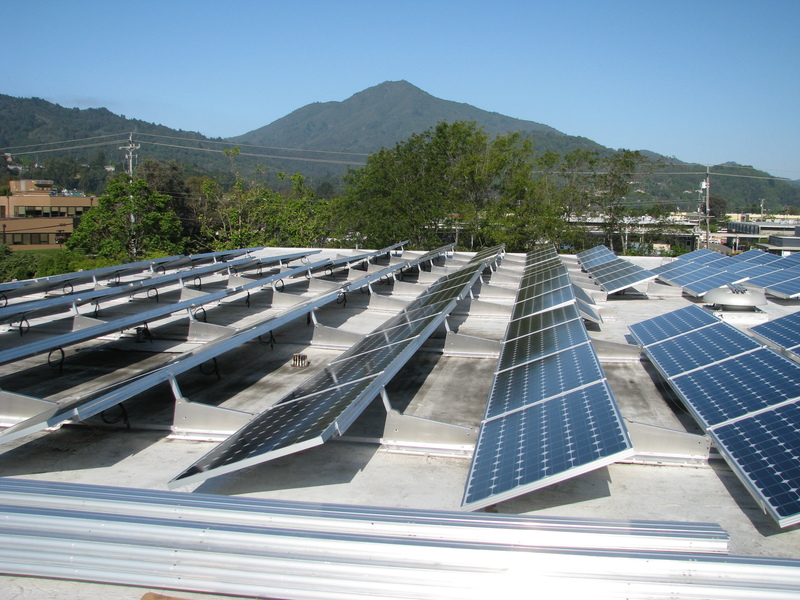 The district began using Marin Clean Energy in 2010 and converted 203 accounts by last year. Now that Novato, Ross, Larkspur and Corte Madera have joined Marin Clean Energy, we are able to convert our remaining accounts. Most of the energy MMWD uses is for pumping water into and throughout our 147-square-mile service area. On Saturday, April 3, water began flowing over the spillway at Kent Lake. With the spilling of Kent Lake, the district’s seven water supply reservoirs are now at 100 percent capacity. The last time that all of the reservoirs were filled to capacity was on April 22, 2006. The combined capacity of the reservoirs is 79,566 acre-feet*. The current water storage is about 110 percent of the average storage for this date. The rainfall at Lake Lagunitas for the season to date is 50.27 inches, which is 106 percent of the average rainfall for this date. Considering it is only early April, there is a very good chance that the seasonal rainfall at Lake Lagunitas will exceed the average annual rainfall of 52 inches. The average monthly rainfall amounts at Lake Lagunitas in April and May are about 3.5 and 1.5 inches respectively. The rainy season got off to an auspicious start in October with much above average rainfall. Other than November, which was quite dry, the monthly rainfall amounts have been close to the average values for the months of December through March. It looks like water year 2010 will go into the record books as a good year for water supply here in Marin County. *One acre-foot is 325,851 gallons. Heavy rains fell across the district on both October 13th and again on the 19th. The rainfall on the 13th was particularly heavy and represents the biggest October storm since 1962. Lake Lagunitas rainfall has totaled 9.63 inches in October. If no additional rain occurs this month, October 2009 will be the 6th wettest October in the 131 years that rainfall records have been kept at Lake Lagunitas. Total annual rainfall at Lake Lagunitas averages about 52 inches. Significantly above average rainfall (more than twice the average) has occurred in October about 20 times in the period of record. Of those years with significantly above average October rainfall, about 60 percent ended with above average annual rainfall, about 20 percent turned out to be average, and about 20 percent experienced below average rainfall for the year. As these statistics indicate the rainy season is off to a promising start. However, early rains have also occurred in drought years. October 1975 was also very rainy (about 8 inches). The 1975/76 rainy season turned out to be very dry and the first year of the most severe drought of record.